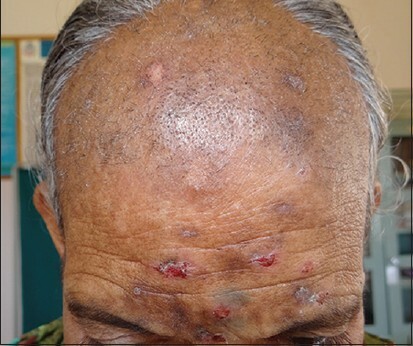 Background: Several dermoscopic findings in alopecia areata (AA) are characteristic and aid in the diagnosis of this disease. Studies evaluating the clinical significance of these findings in AA in dark-skinned individuals are sparse. There is no literature of correlation of dermoscopic findings to severity of disease. Aims: The aim was to determine the dermoscopic findings of AA in dark skinned individuals and to assess whether certain dermoscopic findings correlate with disease activity and severity. Materials and Methods: Totally 116 patients with AA were included in the study. 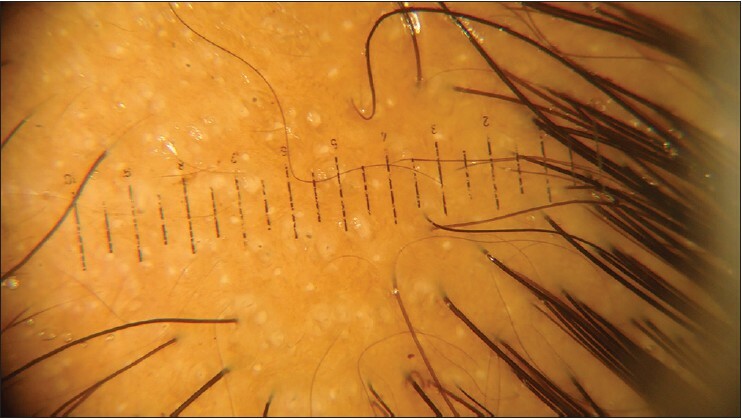 After a thorough clinical history and examination to note type, severity and activity of the disease, dermoscopy was performed using a Heine Delta 20 dermoscope (Heine optotechnik,Herrsching, Germany) and the results were noted in a proforma. Statistical analysis was performed using SPSS13 software using appropriate statistical tools. Results: Dermoscopic findings were nearly similar to that described in western literature. Yellow dots (YDs) were found to be highly sensitive for diagnosis, increased frequency being seen in Indian prepubertal patients when compared with western literature. YDs/field of vision (FOV) were found more frequently in severe types of AA. There was no correlation of dermoscopic findings to severity of disease. Conclusion: Dermoscopic features are similar to that described in the literature. However, YDs are seen in higher frequency. YDs/FOV could serve as dermoscopic criteria to grade severity of AA. Introduction: Trichotillomania (TTM) is characterized by patchy alopecia of hair bearing areas. This is because of compulsive urge to pull the hair. Scalp is the most common site for pulling hair. Usually, patients may have only small areas of baldness, in severe forms, tonsure pattern of baldness is observed. Diagnosis is by history and clinical examination. 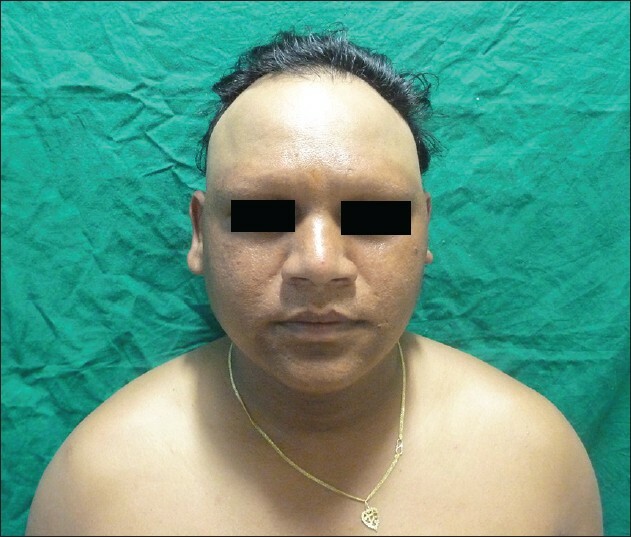 However, it is difficult to differentiate from other causes of noncicatricial alopecia. Here, authors observed trichoscopic patterns and evaluated their importance in the diagnosis of TTM. Materials and Methods: This study was conducted in S. Nijalingappa Medical College, Bagalkot, from January 2014 to July 2014. Ten patients with clinically suspected TTM were included in the study. Informed consent was taken and ethical clearance was obtained. Dermlite3 dermoscope was used with Sony camera attachment to save the images. Histopathological examination was conducted in all the patients to confirm the diagnosis. Results: Ten patients were included in the study. Mean age of the patients was 34 years. Most common symptom was patchy loss of hair in the frontal area (100%). Common trichoscopic feature was decreased hair density and broken hairs. Trichoptilosis ("split ends") and irregular coiled hairs were seen in 80% patients. Novel diagnostic signs like black dots, flame hair, v-sign, follicular hemorrhages, were seen in 30% each. 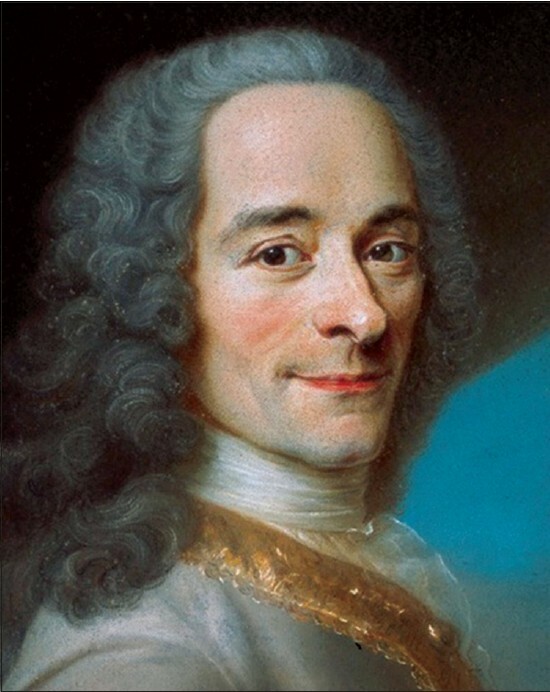 Tulip hair and hair powder were observed in 10% of patients. All patients had the noninflammatory alopecia with distorted and collapsed inner root sheath in histopathology. Conclusion: Trichotillomania is often chronic and difficult to treat. Hence, early diagnosis and treatment is necessary. Authors believe that the trichoscopy plays a vital role in the diagnosis of this condition by demonstrating specific trichoscopic patterns. Aim: The present study was designed to categorize alopecia areata (AA) into various stages based on histopathology and further study the direct immunofluorescence (DIF) pattern. Materials and Methods: The current study is noninterventional, prospective study on 25 consecutive patients suspected of AA based on clinical assessment. Histomorphologic features and immunoreactivity for IgG, IgM, IgA, and C3, was studied on biopsy material. Results: Age of the patients ranged from 6 years to 48 years with a mean age of 28.56 ± 21.8 years. Majority of patients, 9 (36%) were in the age group of 21-30 years. Of 25 patients, 13 (52%) were males and 12 (48%) were females. Male: female ratio was 1.1:1. On histopathology majority of cases were in subacute stage 9 (36%), followed by chronic 7 (28%), acute 5 (20%) and recovery stages 4 (16%). Three (12%) of 4 cases showed characteristic swarm of bees appearance. Two (8%) of the cases showed presence of giant cells. Increased numbers of catagen hair were seen in 12 (48%) cases. Of 25 cases, 9 (36%) cases showed positive DIF with granular deposits. The most common immunoreactant was IgG in 7 (28%) cases, followed by IgA in 4 (16%), C3 in 6 (24%) and IgM in 3 (12%) cases. Of 9 cases showing positive staining, 3 (12%) were in acute stage and 2 (8%) each in subacute, chronic and recovery stages. Conclusion: The observations further reiterate that immune mechanisms play a role in the pathogenesis of AA. Background: Hair restoration surgery (HRS) is a very promising and sought after aesthetic procedure with very few complications. Complications may occur in the donor or the recipient area, and it may be due to surgical or idiopathic causes. 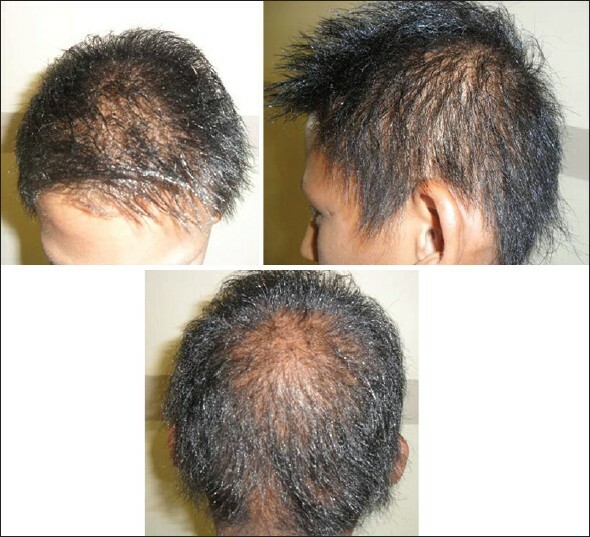 Aim: The aim was to analyze the complications in male patients who underwent HRS for androgenetic alopecia (AGA). Materials and Methods: We conducted a retrospective analysis of male patients who underwent HRS for AGA from December 2010 to August 2014. Data were collected from the registers, telephonic enquiry and electronic mails. All complications during and after surgery, and their subjective feeling about hair growth was recorded. Results: Seventy-three patients were included in the analysis. A total of 65 patients had undergone follicular unit transplant, 7 patients underwent FUE, and one patient had body hair transplantation. Postoperative edema was found in 42.47% of patients, followed by sterile folliculitis in 23.29% of patients, wide donor scar in 15.07% of patients, bacterial folliculitis and numbness/paresthesia in 10.96% of patients. Other complications such as raised scar, hiccups, pruritus, excessive bleeding were found in isolated cases. Conclusion: Thorough preoperative evaluation, skillful surgical techniques, good communication and postoperative follow-up go a long way in giving satisfactory outcome with fewer complications in HRS. Pilomatricoma presents as a single, slow-growing, painless, superficial mass arising from the hair matrix cells, over the hair-bearing areas of the body, especially the head and neck. Perforating pilomatricoma is a rare variant of pilomatricoma presenting as crusted or ulcerated nodule. Here, we report a case of 62-year-old female presenting with rapidly growing noduloulcerative lesion on the left cheek, which on histopathology showed perforating pilomatricoma. Pilomatricoma is a benign cutaneous appendegeal neoplasm which occurs as dermal nodule on head and neck region of children and young adults. Tumors pose a potential difficulty when diagnosed on fine-needle aspiration cytology. In this communication, we illustrate the cytomorphological features of pilomatricoma in a 38-year-female who presented with a nodule over the parotid region. Repeated aspirations of this nodule revealed low cellularity and cytology was hence inconclusive. The final diagnosis was made on histological examination and then retrospectively when those paucicellular cytological smears were analyzed again; showed features that could have driven the pathologist toward pilomatricoma. Familiarization and careful cytological examination under appropriate clinical conditions is warranted. Trichoptysis is a rare symptom, but pathognomonic of a teratoma having a bronchial communication. Thoracic teratomas are usually located within the anterior mediastinum, but rarely present with trichoptysis, as transpleural erosion of a mediastinal teratoma into lung and hence bronchial tree is exceedingly rare. 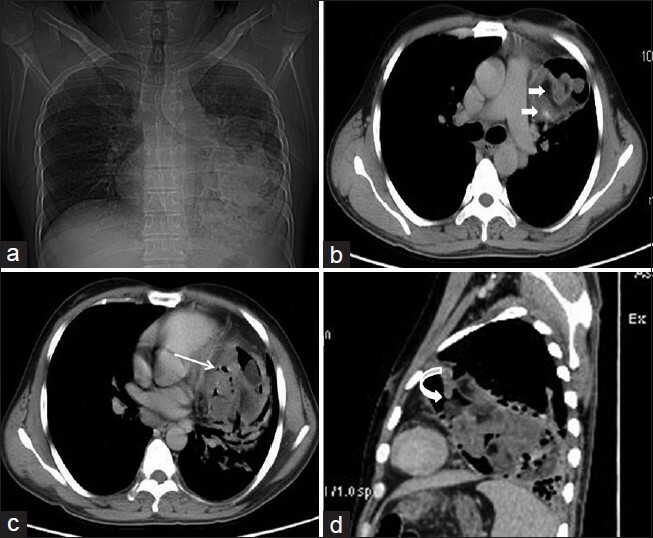 We report the characteristic radiological and clinical features in one such case with ruptured mature mediastinal teratoma having a bronchial communication leading to trichoptysis. 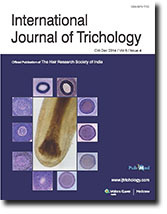 Only nine cases of trichoptysis have been reported in the literature as yet, but a fistulous communication with the bronchial tree on computed tomography, as seen in the present report, has not been demonstrated in any of these preceding reports. Histopathological sample obtained during the surgery further confirmed the presence of a mediastinal teratoma with transpleural broncho-pulmonary communication. Pili multigemini is a rare disorder where more than one hair exists in a single hair follicle. Papillar tips that divide into several tips will produce several hair shafts, so that characteristically do not fuse again. This disorder is relatively frequent on the beard of adult men and on the scalp of children. However, extensive areas of pili multigemini in other locations have rarely been described. 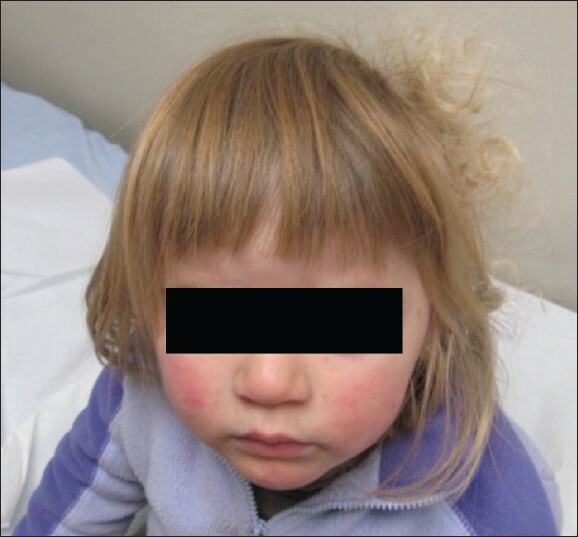 Marie-Unna type of hereditary hypotrichosis is a rare autosomal dominant disorder that has a distinctive type of hair loss pattern that varies with child's age. It is characterized by sparse or absent hair at birth with regrowth of coarse, wiry twisted hair from childhood, followed by progressive loss on approaching puberty. We report a 12-year-old male child with characteristic clinical features suggestive of hereditary hypotrichosis of Marie-Unna type. 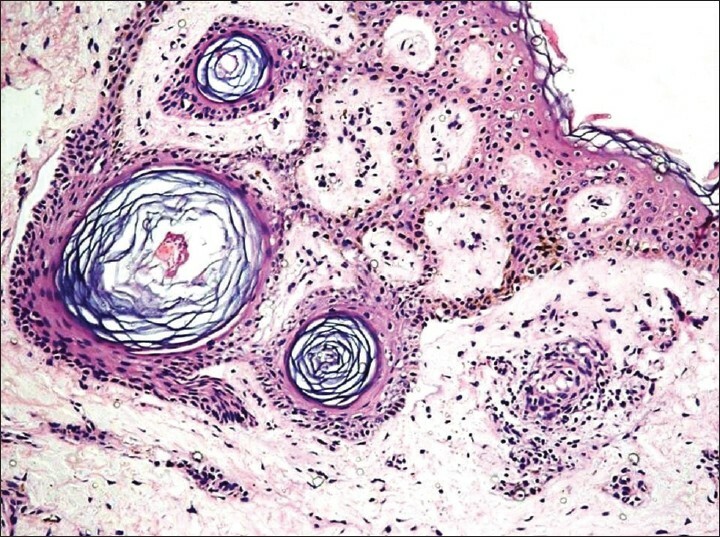 Pilar sheath acanthoma is a rare, benign follicular hamartoma that frequently presents as an asymptomatic, flesh-colored papule with a central opening. First described in 1978 by Mehregan and Brownstein, these lesions generally appear on the upper lip of elderly patients. 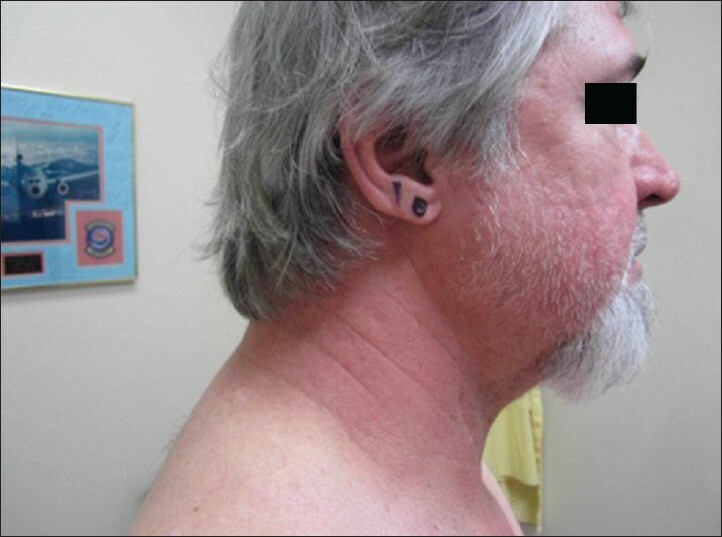 We present an interesting case of a pilar sheath acanthoma presenting on the earlobe in a middle-aged male. To the best of our knowledge, this is the first reported case of a pilar sheath acanthoma found in such a unique location. Woolly hair nevus (WHN) is a rare hair condition, with only a few cases reported. It affects young children of both sexes and currently, there is no available treatment. When WHN is associated with an epidermal nevus, further study is required to rule out ophthalmologic and neurologic abnormalities. We present the case of a Chilean 3-year-old healthy girl with a WHN, with no other clinical findings. This case illustrates a WHN in which the benign and chronic nature of the disease must be advised to the parents in order to prevent further concerns.